Most of us are lucky enough to be able to enjoy books, they’re a relaxing past time, something to devour whilst sunbathing, or when curled up on a winters evening. For those with enough creativity, books are the way they earn their leaving, but few can claim that books are vital to their existence: a matter of life and death. But for many charities the selling of second hand books is essential. Oxfam, for example, sells £1.6 million worth of books every month, enough to fund their education programme in Niger for over a year or buy safe water for 2.1 million people. 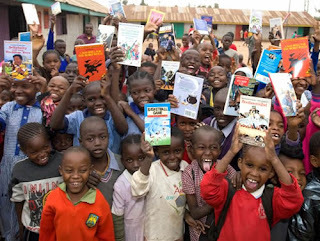 On a smaller scale, the sale of one book in an Oxfam shop could pay for a school book for a child in Somaliland and provide safe water to a child in an emergency, for sixteen books Oxfam could pay for a school desk and chair, and a child’s health check, or eighty six books could pay for a teacher to be trained in Kenya. It is crucial for charities to maintain and improve its sale of books and remind people of the value of donating and purchasing from their shops, and to generate additional interest wherever possible. Charities are always thinking up new schemes to boost donations, using Oxfam as an example, last year their annual Bookfest, resulted in a staggering 750,000 books being donated in three weeks, and hundreds of thousands of pounds were raised in additional book sales. But charities often do not have the revenue to continually remind me people of the value of donating, so here’s a little plea from me. Everyone of you undoubtedly has a bookshelf bulging with books, stacked high and wedged in. Do you need all of those books? I only keep books that are either of sentimental value, or that I would grade a 5/5. The rest get re-homed, re-used, and re-enjoyed at my local charity shop. Last week I dropped off eight books, which means thanks to me, there are eight extra children in Somaliland with school books.